The nun explains the commitment of the sister-doctors: "They are dedicated to people in remote areas. They provide preventive, curative and even palliative assistance service in the most disadvantaged areas of our great nation. They follow Jesus’ footsteps with a great passion for God and compassion for humanity". Today, health care in India is going through a difficult historical context: "Health services have become a business. The commitment, ethics and dedication of doctors are constantly being challenged by increasing consumption, by healthcare practices motivated by profit. The compassionate model of care and the mission of Christian health care, which intends to bring healing and salvation, becomes increasingly difficult". In this context, the nuns have a dual responsibility: on the one hand, the commitment to the Christian vocation as consecrated persons; on the other hand, the service as highly qualified professionals, giving testimony to the authentic vocation of the medical profession. In recent decades, the nuns, through their efforts, have contributed to reducing the rate of maternal and child mortality. Most of them are specialized in gynecology, pediatrics, surgery. 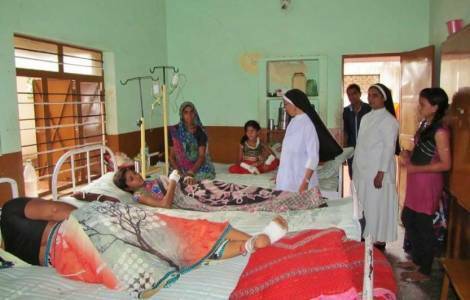 Devoting themselves in particular to the poor and the oppressed, the nuns face difficulties every day, such as the lack of qualified personnel, poor infrastructure, unequipped centers.